I’m a firm believer that people don’t treat vegetables with “respect” often enough. The best thing you can do to a vegetable, or indeed, most cooked food, is to prepare it simply and with a minimum of fuss. I don’t mean that elaborate preparations or exotic ingredients are out the window. What I really object to, is adding an ingredient because it’s trendy, hip or cool. There’s a fine line between ingredient excess and acting as a flavor enhancer. In my opinion, we have become too enamored of condiments such as roasted garlic, white truffle oil and one of the latest darlings in 2012, kimchi. To put things in perspective, salt is an ingredient that people should use more often when they cook, but not to excess where the final product becomes inedible. Salt is a wonderful, almost magical ingredient that has the ability to bring out the flavors of food without too much effort. The opposite is true of balsamic vinegar. A few drops are sufficient in a dessert such as sliced, hulled strawberries with cracked black pepper, or vanilla sugar. More would be overkill. As a case in point, I have a bottle of balsamico aceto tradizionale in my pantry that I’ve had for several years. I’ve used it maybe three or four times since buying it. I think that we have forgotten how the food we eat should taste like, and in the process, lost an appreciation of its natural beauty. Rocambole garlic is an heirloom garlic (hardneck) cultivar that has a sharper, spicier taste than normal garlic. Cloves are fatter, too, averaging anywhere from 8 to 12 cloves per bulb. The type of garlic that you most often see in your regular supermarket is a silverskin (softneck) cultivar. If you don’t have any rocambole garlic available, substitute regular garlic instead. Rocamboles are more expensive — sometimes anywhere from double to triple the price of normal garlic per bulb — but well worth the expense, in my opinion. Season is from early to mid-November to the end of January. There won’t be any available at my farmer’s market until autumn. This recipe makes enough for two side-dish servings or one appetizer for an extraordinarily hungry diner. *I recommend including the outer leaves, but feel free to omit if you’re not a fan. Fill a medium-sized pot with approximately two cups water and a pinch of salt. Add cauliflower. Bring to a boil and simmer on medium heat until cauliflower is done, about 5 minutes. You’ll know it’s done when a floret barely gives any resistance upon being pierced by a fork. Try not to overcook the florets; ideally, they should still retain their pale green color. Drain. Pour about two tablespoons olive oil in a skillet. Add garlic to the cold pan. Gently heat olive oil over medium heat. Once the garlic begins to turn a pale gold, add the cauliflower to the pan. 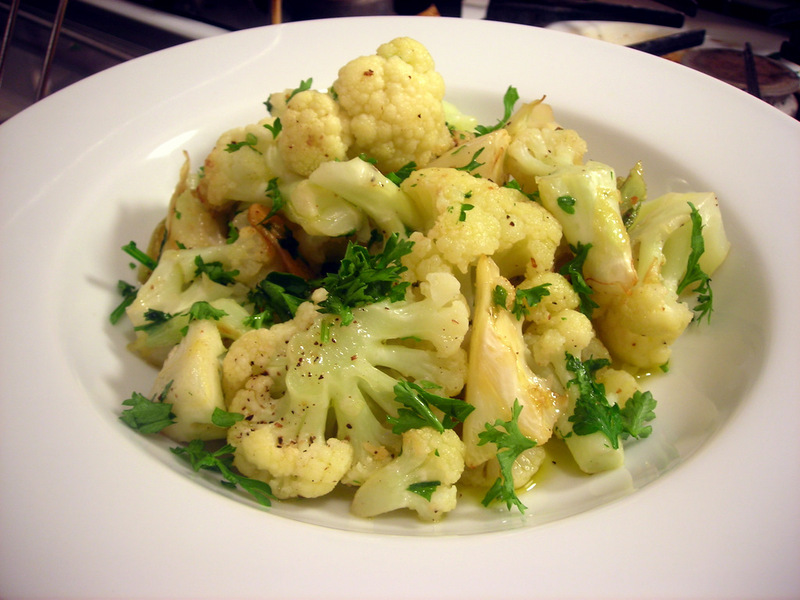 Sauté the cauliflower until the florets begin to turn a light gold or golden-brown. Remove pan from heat. Taste for salt and pepper. Stir in parsley. Spoon onto individual warmed serving plates. Drizzle each with some additional extra-virgin olive oil, if desired, then serve at once. Time: About 25 minutes, including prep. This is my first entry for Weekend Herb Blogging #322, which is being hosted by Aitina, Branka and Conchita of Fragoliva and organized by Haalo of Cook (almost) Anything at Least Once. Weekend Herb Blogging is a weekly foodblogging event that was originally begun by Kalyn of Kalyn’s Kitchen. 19 Feb	This entry was published on February 19, 2012 at 7:00 pm. It’s filed under cooking, food, food photography, recipe, vegan, vegetarian, Weekend Herb Blogging, winter and tagged appetizer, cauliflower, food photography, gluten-free, side dish. Bookmark the permalink. Follow any comments here with the RSS feed for this post. I find your blog a pleasure to read. And wanted to let you know that you won the Leibster Blog Award. Congratulations and best wishes! Thank you for submitting WHB this week, simply delicious recipe. It was my pleasure, ladies.